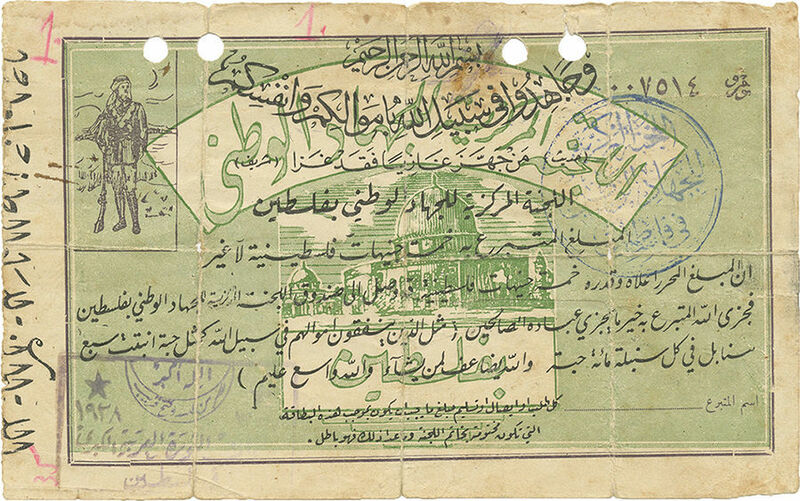 A receipt for a donation to the "Central Committee of National Jihad in Palestine", [Damascus, 1938]. Arabic. A printed receipt, with illustrations of a fighter and of the Dome of the Rock in Jerusalem, ink-stamped by the organization. The Central Committee of National Jihad in Palestine was founded in 1937 with the aim of financing and assisting the leadership of the Great Arab Revolt in Palestine. The committee was located in Damascus, where its members gathered after the British issued arrest warrants against the leaders of the revolt. Among the committee members were Izzat Darwaza (educator and political activist, born in Nablus, one of the first national movement activists in Great Syria), Jamal el-Huseini, Akram Zaitar, and others. 17.5X11 cm. Fair-good condition. Folding marks and creases. Many stains. Tears and rubbings at margins and folding marks. Four filing holes at the top. Pen inscription on the back.